In this current economy, when our money and investments could mean if we are able to pay for the roof over our head or a meal on our dining room table, everyone wants to make a sound choice when it comes to purchasing an automobile. Each year J.D. Power and Associates help determine that choice by releasing their annual Vehicle Dependability Study. 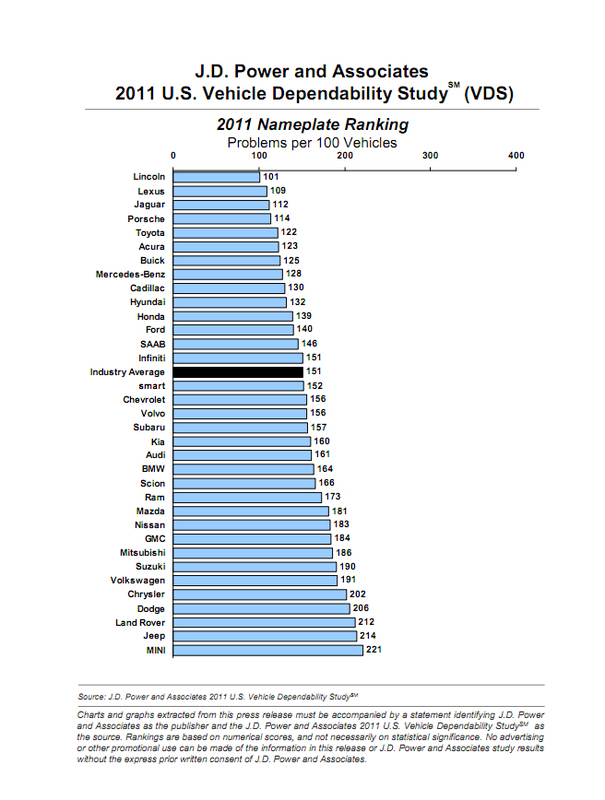 The study scores each auto make by the number of problems per 100 vehicles. For 2011 the J.D. Power and Associates Vehicle Dependability Study reveals Lincoln as a leader for the first time with only 101 problems per 100 vehicles. Lexus comes in at a solid second place with 109 problems per vehicle with Jaguar, Porsche and Toyota following behind but still ranking considerably well. J.D. Power polls about 43,700 original owners and their problems experienced within the past 12 months on 2008 model-year vehicles after a total of three years of ownership. The study is designed to reveal and predict the durability of future vehicle purchases. You may view additional detailed data on the J.D. Power and Associates site in regards to this year’s Vehicle Dependability Study. We have also provided the initial charts and full press release below. 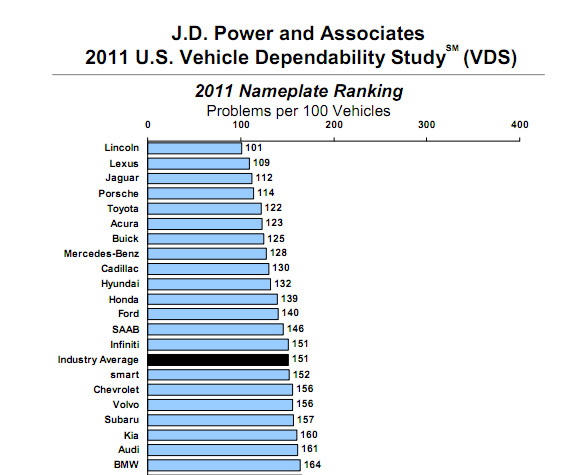 WESTLAKE VILLAGE, Calif.: 17 March 2011 – Overall vehicle dependability has improved from 2010, with automakers succeeding in reducing problem rates in many traditional areas, but experiencing some challenges in overcoming problems with newer technologies and features, according to the J.D. Power and Associates 2011 U.S. Vehicle Dependability StudySM (VDS) released today. The study, which measures problems experienced during the past 12 months by original owners of three-year-old (2008 model year) vehicles, includes 202 different problem symptoms across all areas of the vehicle. Overall dependability is determined by the level of problems experienced per 100 vehicles (PP100), with a lower score reflecting higher quality. The Vehicle Dependability Study is used extensively by vehicle manufacturers worldwide to help design and build better vehicles-which typically translates to higher resale values and higher customer loyalty. It also helps consumers make more-informed choices for both new- and used-vehicle purchases. Among new-vehicle shoppers, perception of quality and dependability is the most influential factor in their decision to purchase a specific vehicle model, according to J.D. Power and Associates. In 2011, overall vehicle dependability averages 151 PP100-the lowest problem rate since the inception of the study in 1990-and improves from 170 PP 100 in 2009. Between 2009 and 2011, annual improvement for the industry has averaged 6 percent, which is slightly lower than historical rates of improvement. During the past decade, industry improvement has averaged 8 percent each year. The slowdown in improvement is largely attributable to increased rates of problems with electronic features in vehicles, including audio, entertainment and navigation systems and new safety features, such as tire pressure monitoring systems. According to Sargent, as newer technologies become more widespread, enhancing the dependability of these features has become an important point of differentiation among automakers. For the first time since the inception of the study, Lincoln leads the overall nameplate rankings in 2011. Lincoln improves by 13 PP100 from 2010. Lexus follows Lincoln in the nameplate rankings. Rounding out the top five nameplates are Jaguar, Porsche and Toyota. The Porsche 911 has the fewest problems in the industry, with just 68 PP100. Toyota Motor Corporation continues to perform well in long-term dependability and garners seven segment awards-more than any other automaker in 2011-for the Lexus RX, Scion xB, Toyota 4Runner, Toyota Prius, Toyota Sienna, Toyota Tacoma and Toyota Tundra. 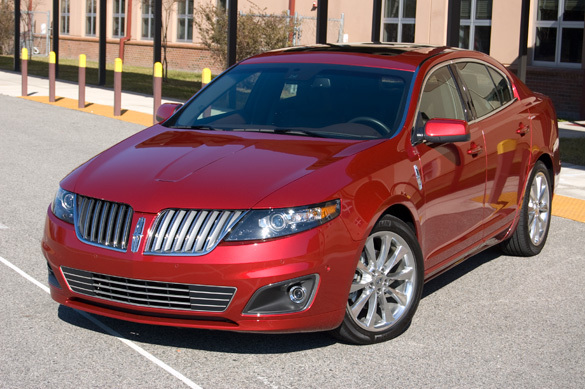 Ford Motor Company receives four model awards for the Ford Fusion, Ford Mustang, Lincoln MKZ and Lincoln Navigator. General Motors (Buick Lucerne, Cadillac DTS, and Chevrolet Tahoe) and Honda Motor Company (Acura RL, Honda CR-V and Honda Fit) each receive three awards. In addition, the following models also receive awards: BMW X3, Mazda MX-5 Miata, and Mercedes-Benz CLK. The study finds that while domestic brands have closed the gap in initial quality with import brands, there is still a considerable difference between the two in vehicle dependability, with import brands outperforming domestic brands by 18 PP100 in 2011. This is consistent with findings of the 2008 Initial Quality Study,SM which examined the models included in the 2011 VDS after 90 days of ownership. While domestic brand cars have fewer problems (135 PP100, on average) than import brand cars (147 PP100, on average), trucks and crossover vehicles1 of import brands have considerably fewer problems than those of domestic brands. In addition to affecting brand image and brand loyalty, long-term dependability also has a notable effect on dealership service and customer service spending. As the number of problems experienced increases, owners are increasingly likely to use non-dealer service facilities for paid service work. In addition, as the number of problems increases, the percentage of owners who say they “definitely will” return to their dealer for service diminishes. Among owners who indicate they have experienced no problems, 76 percent indicate they “definitely will” return to the dealer for paid service. This proportion decreases to 42 percent among owners who say they experienced six or more problems. 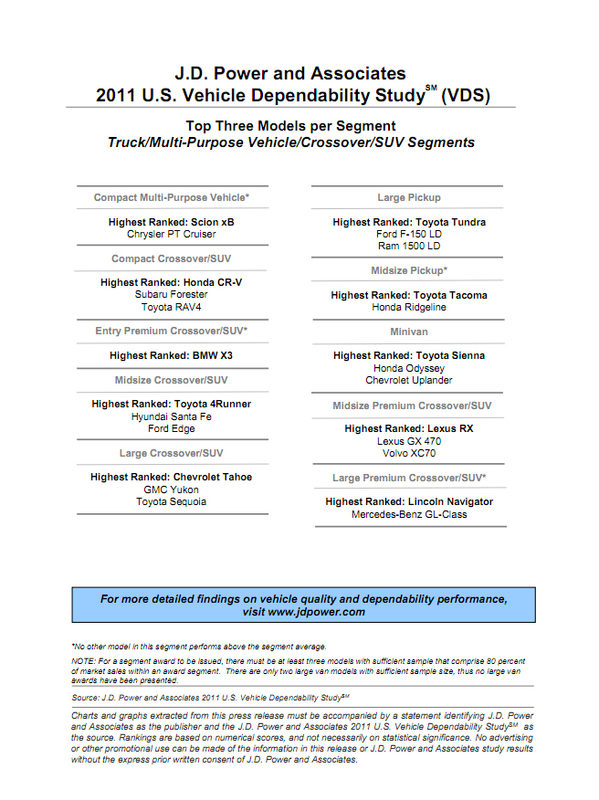 The 2011 Vehicle Dependability Study is based on responses from more than 43,700 original owners of 2008 model-year vehicles after three years of ownership. The study was fielded between October and December 2010. 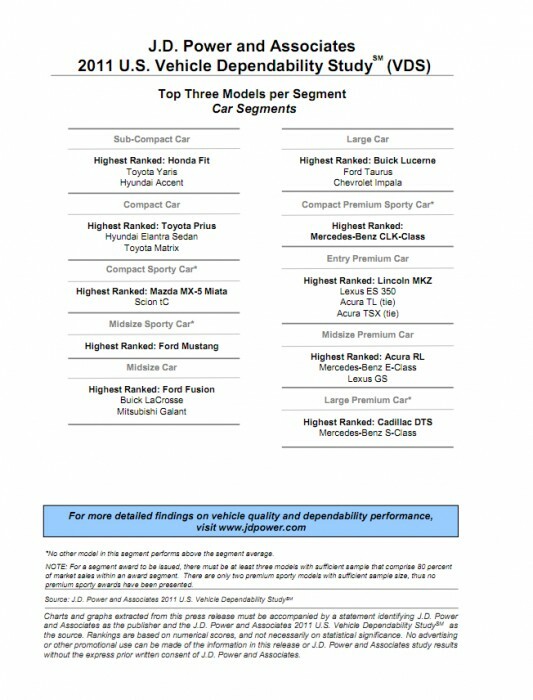 Find more detailed findings on vehicle dependability as well as model photos and specs by reading an article and reviewing brand and segment dependability ratings at JDPower.com. 1The truck category includes both pickup trucks and vans, while the crossover vehicle category includes crossover vehicles, multi-purpose vehicles and utility vehicles. Founded in 1888, The McGraw-Hill Companies is a leading global financial information and education company that helps professionals and students succeed in the Knowledge Economy. Leading brands include Standard & Poor’s, McGraw-Hill Education, Platts energy information services and J.D. Power and Associates. The Corporation has approximately 21,000 employees with more than 280 offices in 40 countries. Sales in 2010 were $6.2 billion. Additional information is available at http://www.mcgraw-hill.com.